Conflict. It’s kind of scary word. Like it or not, it’s something we all deal with on a daily basis. On one hand conflict can handcuff us and put us on the defensive and lead to a divisiveness that is counterproductive to progress. On the other hand conflict can challenge us, make us reevaluate our stance and perhaps look at the world a different way. It really depends. Ultimately, it comes down to whether or not you trust the intentions of the other person or not. I’m on the playground a lot. I do it by choice because I find I can head off a lot of problems before they get big. A large part of my time outside is helping kids negotiate conflict. In almost every instance conflict arises from miscommunication. Too often kids don’t trust, take the time, or even have the ability to take the other person’s perspective. When I work with kids to understand each other’s intentions and share what each person was thinking we almost always can solve the problem. When I am dealing with adults the scenario is almost the same. When people are upset it almost always due to lack of communication, or lack of trust. In my experience we are all on the same team. We all want what is best for the students that we work with. Sometimes, the needs are different. A parent is concerned with their child, and a teacher with all the students. A teacher is concerned about their classroom, but I am concerned with all the classrooms. But at their root they are the same – we all want a high functioning school where all kids can be successful. When in a situation of conflict, I trust the intention of the person I am with…even if they are upset. It doesn’t matter if it is a parent or teacher, I know they have the best interest of the children at the heart of the matter. When I trust first, it allows me to listen and see what the issue is. When I listen and understand the issue we can move forward. If we reframe conflict as a challenge or a problem to be solved we change the paradigm. Conflict often arises because of a difference of opinion, so when we trust the intention of the people we differ with we can get new insight and see the world through a different lens and perhaps stumble upon some new learning. When we take the time to listen and really hear someone else’s perspective before offering our own is how we build trust and integrity. If we start with trust, then spend time listening there is no limit to the learning that can happen. Thank you for this post! 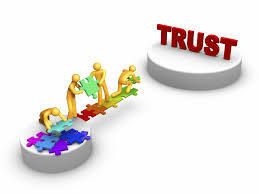 You are right, trust is critical. I wonder, do you think we have to first be confident in our own self – our strengths and our faults, before we can really start to listen? and before we can trust? I know when we were first starting out with our journey with our child, I was not confident in the way I was parenting him, and believe me, we received all sorts of messages that seemed to confirm that to me. And thus, it was very difficult to trust the intentions of the people who were supposed to be taking care of my child. As I became more confident that I WAS parenting my child the way I needed to some of those interactions became easier, while others remained mired in defensiveness – the damage had been done. But when I started to reflect on it, it seemed perhaps there was also a lack of confidence on the other side when it came to their own abilities. Appearing to have difficulty accepting that a different way of thinking about a situation could be beneficial. My increased confidence in myself as a parent AND as a person has certainly increased my ability to trust others, but also figure out the best way to deal with conflict that arises. Understanding those moments when it doesn’t matter how many times I say something, and it doesn’t matter how I say it, I won’t be heard – then I get creative and pull people in who will be listened to. We had some really challenging situations this year, and I have to say, I trusted the key person in the school completely. I loved his communication and his openness to exploring alternatives. While I can’t say everything is “happy ever after”, I can say for sure, that although we had some challenging situations, never once did I feel judged or discouraged by that key person. Interesting. I sometimes think of ego getting in the way more than confidence, but my guess it’s both. I absolutely agree, when we get past our own baggage is when we can let our guard down enough to trust others. Thanks for taking the time to comment.